Mom always had Cookie Day when we were growing up. It was a whole day dedicated to making her sugar cookies and icing them! Her recipe for these classic Christmas cookies had to be made a day ahead so that the dough could be refrigerated before we rolled it out for cutting. Fast forward many years when we were publishing the first anniversary issue of Southern Lady magazine. We decided that we would have snowflake-shaped cookies on the cover. I volunteered to make Mom’s recipe and share it with our readers. That evening I went by Mom’s to get the recipe. She just laughed and went to her cupboard where the cookie cutters were kept. She took down the box and tore off the lid where the recipe was printed; she just laughed and said this was her family recipe! I left and went by the store on my way home to get the ingredients. I carried the recipe in and shopped diligently, collecting everything I needed. It was dark when I came out, and I went home to mix up the dough so it could chill overnight. I set out all the ingredients and was all ready to start when I realized I had lost the recipe. I dumped out the contents of my purse—nothing. I call the manager of the grocery store and explained this was an emergency as I must have dropped the recipe as I was shopping. He said he would call back after he walked around the store. When he called he said he was so sorry but had found no recipe. My heart sunk. So I did what any self-respecting desperate woman would do: I got in my car to return to the store and drove to the parking lot where I must have dropped the recipe—nothing. Since it was dark, I decided to get out of my car and walk around the area where I had parked. About that time, bright headlights were shining on me. I stopped dead in my tracks. I could hear the laughter coming from the car. It was the Minister of Music from our church and his entire family. I forgot to mention that I had on my pink fuzzy robe and fuzzy slippers. I just thought I could pull this off with no one seeing me, but I was wrong. Not only had I embarrassed myself, but I lost the recipe. I returned home, and while I was driving all I could think of was the fact that I had single-handedly lost the family recipe. What would I do? I couldn’t tell Mom. So I called my sister and told her of my dilemma. She just laughed and told me she had written down the recipe several years ago, and she read it to me. The photoshoot came off without a hitch, and the recipe was saved. Holiday baking is and always will be very important in our family. 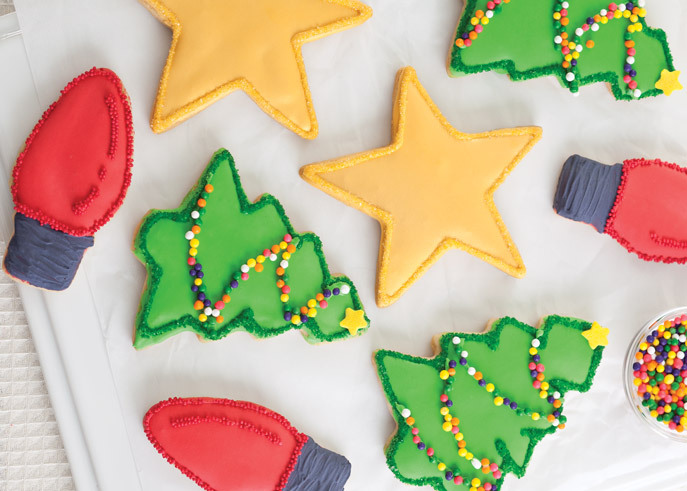 Now, I’m excited to share a classic recipe for Decorate Sugar Cookies from our Christmas Cakes & Cookies special edition. I hope it brings some extra cheer to your holidays this year. 1. In a large bowl, beat butter, sugar, vanilla, and almond extract with a mixer at medium speed until fluffy. Add eggs, one at a time, beating well after each addition. 2. In a medium bowl, combine flour, salt, baking powder, and baking soda. Gradually add flour mixture to butter mixture, beating until combined. Shape dough into a disk, and wrap in plastic wrap. Refrigerate for at least 2 hours or up to 3 days. 3. Preheat oven to 350°. Line baking sheets with parchment paper. 4. On a lightly floured surface, roll dough to ¼-inch thickness. Using desired cutters, cut dough, rerolling scraps as necessary. Place cookies on prepared pans. Bake until edges are golden brown, 10 to 12 minutes. Let cool on pans for 3 minutes. Remove from pans, and let cool completely on wire racks. 5. Decorate as desired with Meringue Powder Icing, nonpareils, sanding sugar, and dragées. Let icing dry completely. Store in airtight containers for up to 1 week. *We used gold sparkling sugar, green sparkling sugar, red nonpareils, and multicolored dragées. 1. In a medium bowl, beat ¼ cup cold water and meringue powder with a mixer at medium speed until frothy. Gradually beat in confectioners’ sugar until smooth. Divide mixture among small bowls. Add food coloring to achieve desired colors. Paint icing onto cookies using small paintbrushes. Love your stories; this one made me laugh out loud!! Thank you for being so real!! Isn’t it fun to be able to laugh at yourself?!? Merry Christmas to you-and eat a cookie for me! This Christmas I celebrated my 43rd year of baking Christmas cookies with my two dear friends. We have made cookies through blizzards and ice storms, before marriage, with kids (and now they do it too where they live), and back down to just the three of us now. We make all kinds, but our favorite is the “boots”. We make a sugar cookie base cut out in a Santa boot shape, cover it with melted chocolate, and spread it with candied fruit and mixed nuts mixed in warm currant jelly. Decadent, but divine! Love to read all your humorous stories. This was a LOL one. I am wondering how long before your sweet Mom heard about this little mishap. This sounds exactly like something I would do. I manage to lose a lot of things that take a lot of effort to find and sometimes never. The cookies sound yummy. I’m so glad your sister had a copy. I love reading all the comments. My family traditions include a delicious Rocky Road Fudge, peanut brittle, and molasses cookies. I think cut out sugar cookies must be a tradition in everyone’s family–mine as well. There is probably nothing better on a cold winter’s day than milk and a cookie warm from the oven. Merry Christmas to you, Phyllis, and your family. Merry Christmas to all you women whose comments I have enjoyed reading throughout the year. My family tradition are honey coated balls with sprinkles ( Strufoli) in Italian). I make these with my brother every Christmas…. I do all the prepping and he fries them in my deep fryer… It would not be Christmas if we did not do these together! My family would be very disappointed if they were not on my Christmas dessert table. I have to say one more thing. I bet there is not one of us reading your blog that has not gone out in our pjs and coat praying not to be seen. What an extraordinary woman you are! Our childhood is where Christmas starts isn’t it. Our tradition was 1 batch of the most delicious shortbread ( butter was expensive) that was rationed out to us over the holidays. I still remember the smell of the kitchen…..
As a working Mom, I would have a baking day like your Mom and many Christmas goodies scented up my kitchen. One year in particular, my son was the Christmas tree in the school play. We made a cardboard tree and I decorated sugar cookies to pin onto the tree. After the play, the kids all had a treat from that tree. Wish I had a pic to add to this post. Your story sounds like something I would have done (drive to the parking lot in my PJ’s!!) I would have been sick! But I am glad that it is one of those stories we can all chuckle over now!! What fun to share with us! Mother also made sugar cookies with sprinkles. Lots of fun to get our little hands in the dough and sneak a bite fom time to time. I started a tradition with my daughter of doing gingerbread houses. We made our own house and then made up this egg batter with eggs and powdered sugar that would harden so we could use them for decoration. Her senior year in high school she ask to invite 10 of her girlfriends to do this. The date was set and as usual I waited the day before to get all these ingredients. My car was filled with 11 houses, dozens of eggs, boxes of powdered sugar, candies and sprinkles of all kinds. On the way home it began to snow here in Asheville and we had one of our deepest snows. All I could think about was the load in my car. Needless to say, the girls could not come. I gave away as much as possible and fixed eggs every way I could think for a few days. Every year I remember with such joy the big snow and my trunk loaded down with all this stuff. My daughter has carried on this tradition with her children since my grandson was born 12 years ago. It is in these Times we may find our greatest memories, have our biggest laughs and know real joy! Blessings to all! Of course Janice would save you. That is what sisters are for. Oh Phyllis, I thought I was the only one who did things like this. What a fabulously fun memory and thank you for being woman enough to share it with us, lol. I have left the house near midnight, barefoot, in a trench coat and nightgown to drop mail in the drive by box at the post office. I was holding my breath until I was safely back home but at least those bills got in the morning mail. Thank goodness for online pay now when we find a forgotten bill or two under a pile of papers! Thanks for this recipe. I have lost my favorite recipe that was a variation my Mother made. This sounds like it! What a great story Phyllis! Such a fun memory ( now) and one we can all connect to. Thank goodness your sister had the recipe too!